"With a unique twist on Greek mythology and heart-stopping action, AMBER SMOKE keeps you riveted to the very last page." -#1 NEW YORK TIMES bestselling author Jennifer L. Armentrout "With the perfect mix of thrills and chills, along with characters who pop off the page and a gripping plot, this explosive new series is perfect for any Hunger Games and Divergent fans. 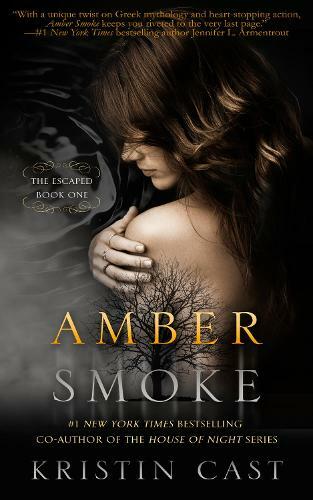 "-RT BOOK REVIEWS "AMBER SMOKE is thrilling and funny with just the right amount of magic. Brilliant!" -Kresley Cole, #1 NEW YORK TIMES bestselling author "In AMBER SMOKE, Cast's wit, creativity and talent shine! I turned the pages at lightning speed, ready for more! What a tasty treat!" -Gena Showalter, NEW YORK TIMES & USA TODAY bestselling author The door to the massive New York Times bestselling HOUSE OF NIGHT series has closed. Now, Kristin Cast kicks down a new door to welcome her millions of fans to her latest sizzling series. There is a world that runs parallel to our own, a world in which the souls of the damned are caged, where they are looked over by the Furies, and where they spend eternity in torment, mirroring the devastation and mayhem they created when alive. Someone has opened the cage. The worst of terrors has crossed the barrier that separates our world from theirs, and the Furies send a great, albeit untested warrior-their only son, Alek-to try to bring those souls back. He is young and handsome, headstrong and impulsive, and he won't be able to do it alone. Eva has grown up, beautiful and beloved, but surrounded by secrets. First, she will be hunted in an ancient feud that will threaten her life. Then, she will become the hunter. With the police closing in and two worlds on the verge of crumbling around them, Alek and Eva must find each other, discover the limits of their powers, and work together to save everything they hold dear, including one another. Blending elements of mythology with the dazzling storytelling that her fans have devoured through the HOUSE OF NIGHT series, Kristin Cast weaves a spellbinding and passionate tale that starts a thrilling new series with an explosive charge.